The reader will find much in this third book in a trilogy of information on growing giant pumpkins. How-to-Grow World Class Giant Pumpkins, III presents the newest information on cultural methods, who's who, and records. New ideas about plant size and pruning strategies throw a whole new light on the grower with only a small area to devote to giant pumpkins. 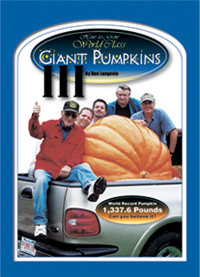 Written as a sequel to both WCGP I & II, it still provides all the neccessary information for a new grower to be successful in their very first year growing the Dill's Atlantic Giant pumpkin. It can be a great companion to either or both WCGP I & II, or a stand alone reference for a new or experienced gardener. Beautifully illustrated, it contains 500 all, new, color images.